When one bets on a sporting event the facilitator of the bet, referred to as a bookie, charges the winner of the bet the vigorish. The vigorish, commonly known as the vig, is a fixed percentage of the bet that serves as compensation to the bookie for providing numerous betting options (liquidity) and the financial surety of collecting on winning bets. Financial institutions, like bookies, are intermediaries. They link borrowers with lenders and investors and provide financial security similar to bookies. The fees, or vig, they charge can be thought of as a tax on capital transactions and thus a tax on the economy. If the vig is excessive, individuals, businesses, and the government are unnecessarily sacrificing capital and wealth to bolster the profits of financial institutions. Regulation is a form of interventionism representing a direct or indirect tax on the economy. More often than not, regulations are sand in the gears of the economic engine with few redeemable benefits and a multitude of unintended consequences. However, sometimes regulation is well worth its cost as it provides benefits that outweigh the economic tax and the burden put on others. The Glass-Steagall Act of 1933 was one such example. While the act narrowed the lines of business in which banks could participate, it protected the banks and, more importantly, the nation’s populace from economic depression. Many factors have weighed heavily on the economy in recent years, and in our opinion, the repeal of Glass-Steagall is one of them. Its repeal in 1999 provides a clear breakpoint in the history of financial institutions and the activities this regulation once restricted. Financial institutions serve as a crucial cog in the economic engine by allowing capital to flow more efficiently. Consider how hard it would be to get a mortgage or auto loan if you had to go to family and friends to borrow money. The task is infinitely complicated when one considers companies and governments that seek hundreds of millions, billions and even trillions of dollars. Financial institutions that facilitate capital transactions of all sorts are paid fees in various forms. When a financial institution acts as a broker in the trading of secondary market securities, they are typically rewarded with a bid/offer spread or a commission. In the case of new equity and debt offerings, they are paid a fee by the issuing entity. Interest rates on traditional loans to individuals and businesses are typically offered at a spread to the institution’s cost of borrowing, thus ensuring compensation for the financial institution providing the loan. Financial institutions require these fees to incent them to commit their capital and, equally importantly, to protect them from the financial risks embedded within these transactions. The Glass-Steagall Act of 1933 was enacted to combat over-reaching banking activities that led to financial instabilities and fueled the Great Depression. The act’s primary purpose was to prevent another banking collapse like the one that was crippling banks and leaving depositors penniless at the time. The legislation’s main thrust was to separate traditional banking activities from trading and investing practices. From 1933 until its repeal in 1999, banks taking deposits were prohibited from trading and underwriting in non-government and non-investment grade securities. The act did not prevent financial crises from occurring, but it certainly prevented a crisis anywhere near the magnitude of the Great Depression. In 1999, Congress passed the Gramm-Leach-Bliley Act (also comically known as the Financial Services Modernization Act of 1999) which repealed Glass-Steagall. The repeal, heavily lobbied for by the banking sector, was promoted to the public as a means to unleash bankers’ ability to provide more capital and liquidity to spur economic activity. Less than ten years after the Gramm-Leach-Bliley Act was signed, financial institutions imploded to a degree not seen since the Great Depression. Without the lifeline of massive tax-payer funded bailouts, unprecedented monetary policy, and questionable accounting standards changes, the financial carnage from the crisis of 2008 might have equaled or even surpassed that of the Great Depression. Many experts warned at the time that the repeal of Glass-Steagall was another instance of greedy bankers looking for a way to pad the bank’s bottom lines and their paychecks with little consideration for the financial stability of their institutions or the potential economic consequences. The bankers won the battle and, as expected, profits in the financial industry soared almost immediately. The graph below plots quarterly annualized financial corporate profits from 1948 to current. The data is separated by color to highlight the periods before and after the repeal of Glass-Steagall. 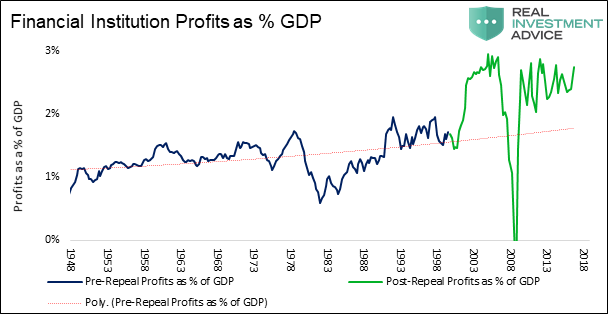 Additionally, the red dotted regression trend line, showing trend profit growth pre-repeal, serves as a useful gauge to estimate the financial benefit to the banks of repealing Glass-Steagall. 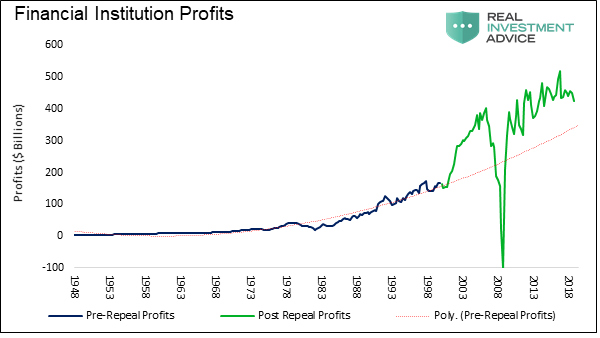 As seen by the gap higher in profits in 1999, and how profits reset to an approximate 50% premium to the pre-1999 trend line, the repeal of Glass-Steagall was a windfall to the financial industry. The financial industry claims that the significant jump in profits, post-repeal, is not just good for them but indicative of the benefits they deliver to corporate America and the economy. Ignorantly, such arguments fail to consider the massive costs shouldered by the citizens of the United States as a result of bailouts and the massive monetary stimulus that continue in unprecedented fashion to this day. Excluding the 2008 bailouts, whose costs are measured in the trillions, we attempt to quantify how much the repeal of Glass-Steagall is costing or benefiting economic activity. Said differently, how has the Vig, or economic tax, changed since 1999. If the bankers are correct that deregulating financial institutions increased economic growth, then we should see an uptick in economic growth commensurate with the increased banking profits as shown above. As highlighted in the graph of GDP below, economic growth did not benefit. In fact, over the last 16 years, the GDP growth rate has been about 2.50% less than the pre-Glass Stegall era. 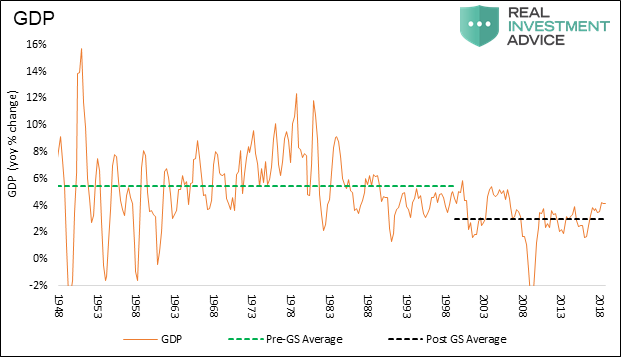 Further, there has not been a quarterly increase in GDP higher than the average growth rate of the prior 50 years. To further highlight the discrepancy claimed in the chart above, the graph below plots financial institution profits as a percentage of GDP. Since 1999, bank profits (green) as a percentage of GDP are running about 1% higher than the red trend line of the prior 50 years. Our blunt take based on the graph above is that the repeal of Glass-Steagall effectively increased the VIG on the economy by 1%. Furthermore, the collapse in profits in 2008 and 2009 was more than restored to financial institutions through the bailouts and extraordinary monetary policies used in the post-financial crisis era. As discussed above, those policies amount to massive subsidies coming at the cost of taxpayers and savers. They are directed at the banks, allowing them to quickly recoup self-inflicted losses. Corporations are the heart and soul of the economy. They produce our goods, offer our services, pay our wages, and invest in productivity-enhancing projects. Therefore the capital flows of these companies are an important factor in economic growth. The more efficiently they can borrow and invest, the more innovation they can generate. Before Glass-Steagall was abolished, financial institutions accounted for 20% of total corporate profits. Over the last 18 years, that amount has doubled to 40%. We remind you that banks do not innovate; their profits represent a missed opportunity for someone else to innovate. When banks take a bigger share of the economic pie, labor, investment activity, corporations and shareholders suffer. The removal of Glass-Steagall has resulted in a large shift of capital from those that consume and innovate to the financial intermediaries or the economic bookies. You may think it a trivial matter that financial institutions are subsidized and profit at the expense of others. After all, those additional bank profits accrue to shareholders who in turn invest the capital back into the economy. While plausible, the fact of the matter is banking stocks have not reflected the higher profits. The KBW Bank Index has risen about 1% on an annualized basis since the Gramm-Leach-Bliley Act was passed. In other words, the shareholders have not been the beneficiaries of the enormous profit growth. Therefore, the riches graphed above have largely gone to those executives and other highly paid employees of these institutions. These circumstances have also widened the wealth imbalance that is so prevalent in the working population today. If you happen to be one of the beneficiaries of the policies aimed at the financial industry, then you probably have done very well and had no complaints. For the other 99% of the working class, there may be some resentment to the fact that they were not only left behind but that they subsidized the policies fueling the wealth of the top 1%.